Book business : publishing past, present, and future. · One Book. One Author. One Hour. Notes on front endpapers: "Gift of storytelling is uncommon. - Bennett Cerf, Donald Klopfer. - Modern Library, Library of America, Everyman's Library. - Joined Random H. 1958 from Doubleday. - Literary Guild. - 1) New York Review of Books, 1963. 2) Library of America - mid-80's. 3) Anchor Books. 4) The Reader's Catalog. - What impact did movie 'Scoundrel' have on you? - Horace Livewright - first of the Jewish publishers. - Wystan Auden - premature arrivals. - Columbia U. 1945. - Whittaker Chambers and Thomas Merton studied there. - Communism and an intellectual form of Catholicism in the air. - I was raised Catholic. - "My ambivalence toward innovation" - paperbacks, p. 65. - I thought of myself as a missionary - wanted people to know about the books I read at Columbia College." - Notes on half title page: "Who started the returns policy? - Chapter 7 - Modern Times: Unlike my friends I had never been attracted to socialism. - Chapter 6: Edmund Wilson - 1/2 dozen martinis. - Library of America - 20 stores that display all books. - Left Board after harsh words. - Directors and Chairman get too much money." -- Notes on back endpapers: "Best advertising for a book - word of mouth. - What do you think is the future? - Amazon.com. - Future of superstores: Borders, Waldonbooks, Barnes & Noble, B. Dalton. - Tattered Cover, backlist, frontlist, midlist. - Norbert Wiener - first hint of the internet came in late 50's; wrote 'Cybernetics'." -- Annotations by Brian Lamb in the margins and underlining of pertinent phrases throughout the book. Examples: p. 11: "...Technological innovations certain to revolutionize the industry will soon render many of the traditional publishing functions of the conglomerates themselves redundant." - p. 19: "Name brand authors don't need editor." - p. 29: "Machines capable of printing and binding small quantities of digitized texts on demand are already deployed by Ingram." - p. 38: "Nonetheless, a civilization without retail booksellers is unimaginable." - p. 161: "The viability of the superstore chains, under pressure from Internet retailers and facing an even more severe electronic challenge in the future as authors and readers are linked electronically, is questionable." - p. 175: "Book publishing may therefore become once more a cottage industry of diverse, creative autonomous units, or so there is now reason to believe." 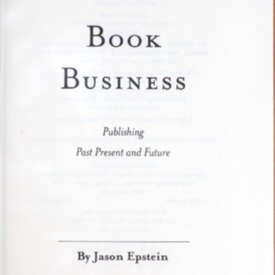 Epstein, Jason, “Book business : publishing past, present, and future.,” One Book. One Author. One Hour., accessed April 24, 2019, http://booknotes.gmu.edu/items/show/734. Jason Epstein has led arguably the most creative career in book publishing during the past half-century. In 1952, while a young editor at Doubleday, he created Anchor Books, which launched the so-called quality paperback revolution and established the trade paperback format. In the following decade he became cofounder of The New York Review of Books. In the 1980s he created the Library of America, the prestigious publisher of American classics, and The Reader's Catalog, the precursor of online bookselling.."In this short book he discusses the severe crisis facing the book business today - a crisis that affects writers and readers as well as publishers - and looks ahead to the radically transformed industry that will revolutionize the idea of the book as profoundly as the introduction of movable type did five centuries ago." --BOOK JACKET.